KAZ ‘Family Edition’ was designed as an economical solution for teaching the whole family to type. Both our Online and Download editions offers 5 licenses for the price of 3 and each license comes with a choice of either Adult or Junior versions - allowing your child to progress from Junior to Adult vocabulary and phrases when they are ready. Our Annual Online version comes with the same powerful back office used by our schools. With this back office / admin panel, parents can create and allocate licenses to each member of the family and monitor all progress (ie. bookmarks, speed and accuracy). Aware that not all children have email addresses, our course allows parents to create pseudo emails, for use when logging in. For our Download license, we offer a lifetime license which is registered to the Mac or Pc to which it has been installed. So should your computer or hard drive crash, simply download the file again - you will not need to re-register your product. All updates can be downloaded for free for the license period. "A friend recommended a free typing tutor. I really wish I didn’t listen. I spent days and weeks wasting my time. In the end I bit the bullet and bought KAZ. Within a 3 weeks I was typing at 50wpm. Now one year on, I’ve bought the family version for my 3 kids too." 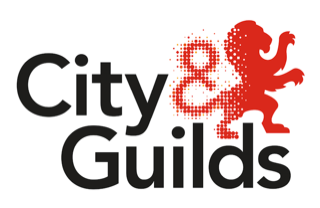 "I put my 6 year old son through this course over the xmas break and I can’t believe he did it - he learned to type the A-Z keys in around 90 mins!" "There are several products out there but I only recommend KAZ." “Very Easy. I bought a version of this about 5yrs ago and successfully learned to touch-type. I am going to buy the latest version now as my kids need to learn. Highly recommended for its simplicity." "I used KAZ as a teacher in my school. I’m now teaching my granddaughter at home." Uses an 'accelerated learning' teaching method - a ‘total system’ for speeding and enhancing the learning process. Uses ‘Brain balance’ - engaging the major senses of sight, sound and touch simultaneously, radically enhancing memory retention and recall - which is why it is so effective. Uses specific combinations and progressions of just 11 words in 5 easily memorised, scientifically structured and trademarked phrases to teach the A-Z keys. 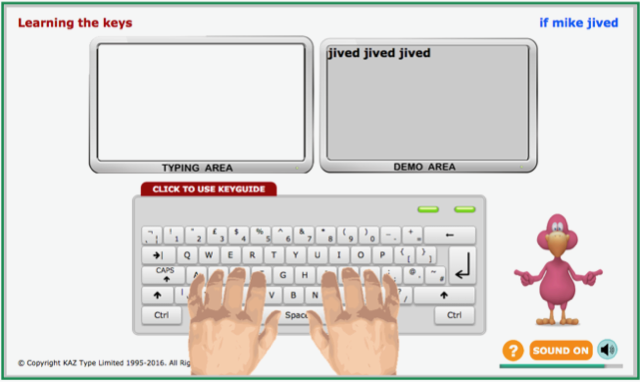 Trains the fingers of both hands to work symmetrically and simultaneously - no other typing tutor works in this way. If already a typist, eliminates bad habits and re-trains the fingers to type correctly. Completely secure site - so all your data is secure. Create family member licences with real or pseudo emails. Each family member has a choice of both Adult or Junior versions. The same powerful back office as used by schools. Watch and monitor your child’s progress - simply click on the book symbol to see their scores. Can be accessed wherever you have an internet signal. Available for Mac or Pc - just download the relevant file. No need to access the internet once installed to your pc. 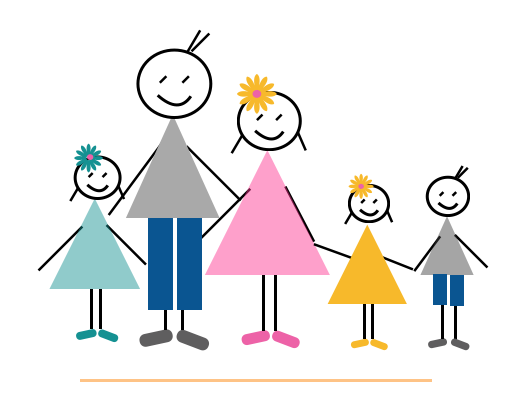 Each family member has a choice of both Adult and Junior versions. 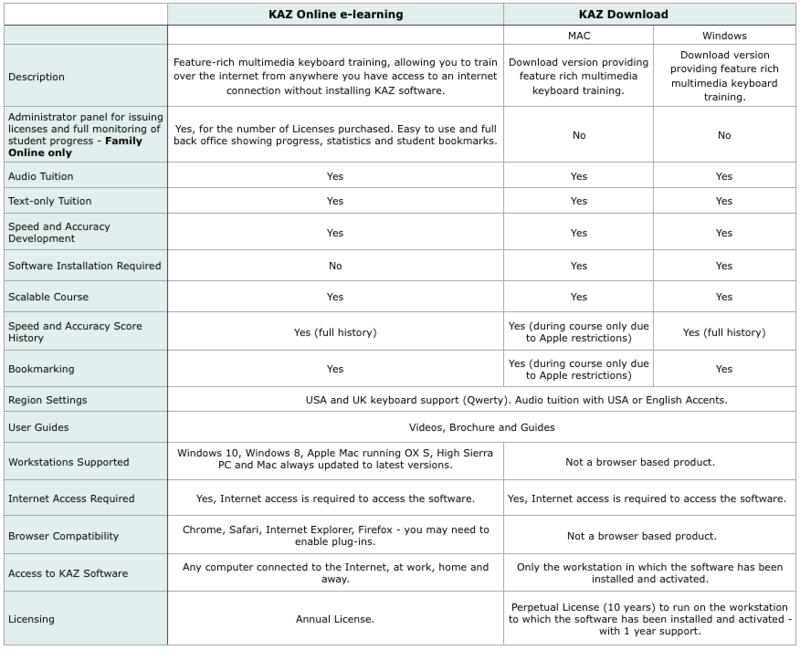 Lifetime license - registered to the Mac or Pc to which it has been installed. One year free help and support. Always run the latest version of KAZ on your computer with our free updates - (to the registered pc). The KAZ method has proven so effective that it is now used by millions around the world. Once the first phrase is completed, a real sense of achievement is gained, motivating the child to continue onto the next phrase and so on. Each section offers encouragement and instruction in short lessons in order to hold interest and concentration. The child is allowed to progress at their own pace, acquiring the skill and gaining speed and accuracy without even realising it. With a multi-sensory approach throught - KAZ is also special needs enabled. Since launch, KAZ’s ‘Family Edition’ has proven extremely popular, being an economical solution for teaching the whole family how to type easily and effortlessly at home or in their chosen environment. 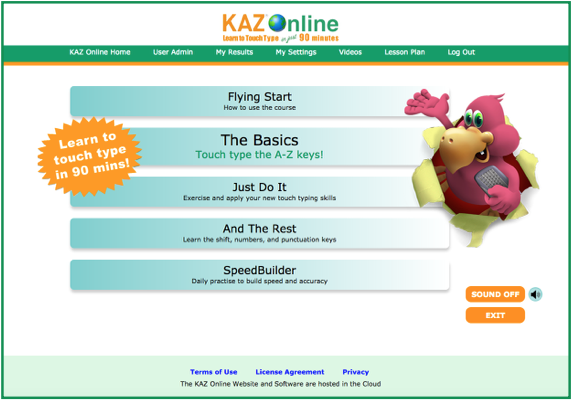 Using the same award winning accelerated learning teaching method, as used by hundreds of teachers when teaching typing in schools, KAZ teaches typing skills methodically and in a structured but light hearted manner, equipping the whole family with a ‘skill for life’. Mobile friendly. All our products comprise both UK and North American options.